Times are changing. Since the recession in 2008, the so called sharing economy is becoming more and more popular. Services like Uber and Airbnb are connecting regular folks who offer some type of service to those who need it. Yeah, it sounds obvious now. But when Airbnb’s founder Brian Chesky pitched his idea to investors the most common answer would be, “This is a really dumb idea!”. Talk about having the last laugh, right? In any case, these revolutions have provided us with an unique opportunity. 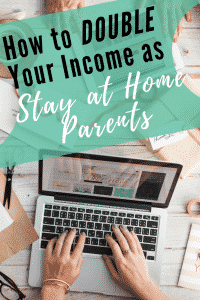 Now we can, even as stay-at-home parents, earn an extra or a full income while we work totally from home. Here are 7 ways you can start now. If this is the first time you hear about fiverr.com, go check it now. You will thank me later. There you can find any possible freelancer you can think of. We did our baby shower invitation with a designer we found there and it cost us U$ 10 for a basic but very cute design. It took 24h to be sent to us and it was an overall great costumer experience. Upwork is also a marketplace for freelancers. It is slightly different from Fiverr in that freelancers charge not per gig but mostly per hour worked. This is a great platform for those of you who speak another language and can translate texts from/to English. Writers will also find jobs pretty easily on the platform. 4) Can Stay-at-home parents babysit? Heck yeah! It is almost becoming a trend now. Many stay-at-home moms, sometimes with as many as 3 to 4 kids, are offering babysitting services. And it actually makes perfect sense. It feels better to know that the person who is taking care of your precious baby has a lot of experience, right? So, you can either just offer your services directly to your friends and neighbors or you can even post an ad online so families in your area can easily find you. And they will pay me to take care of these cuties? This one is for the dog/cat lovers out there. Petsitting is a growing trend in this sharing economy world. People want trustworthy responsible sitters to take care of their pet when they are out of town, traveling for work or on holidays. As we all know, a lot of Stay-at-home parents have pets themselves so having an extra fluffy friend over for the weekend is not that big of a commitment. I’ve done it myself and it was like taking care of my own dog. Just this time I got paid for it. You can find petsitters for hire or post an ad for free as a sitter yourself at care4hire.com. VA stands for Virtual Assistant and it is becoming a pretty common form of hiring now that people own devices that allow them to work from wherever they are. Many small businesses operate on tight budgets and are not quite willing to rent big offices and hire regular employees. Virtual Assistants are flexible and require a lot less infrastructure than regular assistants. This Blog Post actually has great tips about how to find businesses to partner with as a VA.
Last but not least, perhaps the most cliché of ideas when it comes to (dad)momtrepenneur, starting your own blog. There is a lot of pros about start writing a blog, specially for those of you who like to write. However, when it comes to getting paid, writing a blog can take quite a long time and it should be seen more as a long term project rather than a quick fix. The way your monetize your Blogs is either by selling your own products or promoting other people’s products. It is however increasingly more difficult to cut through the noise and be seen. There is so much into starting a blog that it deserves its own Blog post. So there you go. I hope you guys can get some ideas on this short post. Make sure you take action now so you will have a clear direction by the beginning of 2018. Let me know if you have any doubts in the comments and I will make sure to address them.